The simplest rule for staying safe in crocodile habitat is to never enter or approach the water. 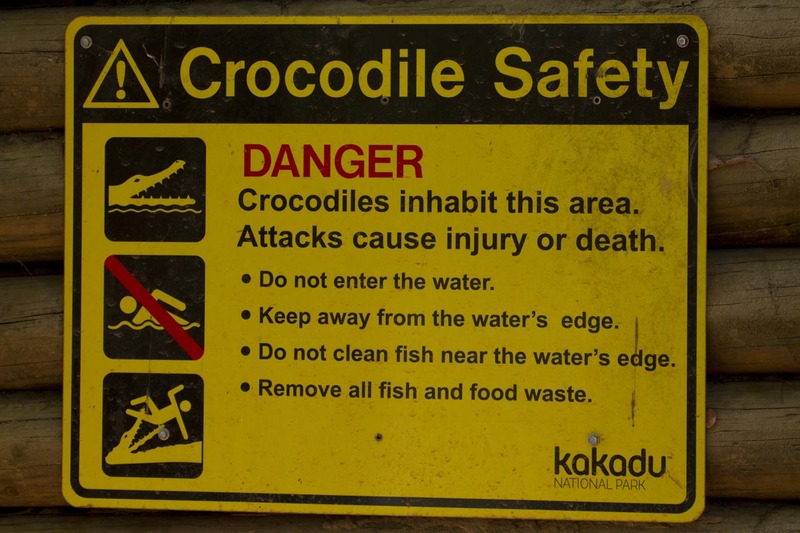 Of course this is not always realistic, but you must assume that any body of water in crocodilian habitat could potentially hold a crocodilian capable of injuring or killing you, regardless of whether the attack is provoked or not. The only exceptions would be areas with robust crocodilian management that are clearly labelled as being safe for swimming. However, even in areas where proactive crocodile management is well-established, ultimate responsibility for your safety lies with you. Below are a number of broad safety guidelines and suggestions to follow where possible, including some dispelling of myths about crocodilian attacks. We have also linked to independent safety advice provided by government and non-government organisations. Keep a look out for crocodilians – it goes without saying that if you see a crocodilian, you should act appropriately by staying out of its way and away from the water. 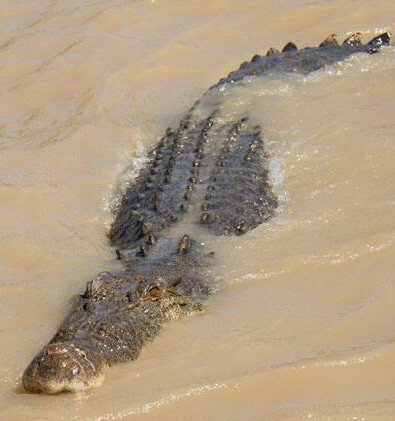 Only swim in designated areas – if you are in crocodilian habitat, you are increasing the risk of being attacked by swimming in any body of water, river, stream or (in the case of saline-tolerant species) around the coast. Some areas are carefully managed to keep crocodilians out, and these are usually marked as such. If you are uncertain whether it's safe to swim, either check first or assume that it's not safe. Observe warning signs - these signs are there for a reason, they warn of the very real risks in and around the water, and anywhere with signs typically means that the risk is greatest in those areas. Lack of warning signs does not indicate safe swimming - safety programs only have limited funds, and it is not possible (nor desirable) to put safety or warning signs everywhere there is water that may be occupied by crocodilians. Treat any body of water in crocodilian habitat as potentially hazardous. Contact local authorities for information - local government departments responsible for education and safety wish to avoid crocodilian attacks at all costs, and are usually happy to provide safety information if you are unsure whether your planned activities may be risky. Do not walk at the water's edge - the closer you get to the water's edge, the greater the risk of being attacked. Where possible try to remain at least 5 m (16 ft) from the water's edge, to give yourself enough time to react and move to safety in the unlikely event that you disturb a crocodilian. Do not wade in shallow water - wading at the water's edge is extremely dangerous in crocodilian habitat, and should be avoided. In some areas (eg. protected areas in Queensland, Australia) it is illegal to do so without good reason. Avoid predictable activities at the water's edge - crocodilians hunt effectively by learning routines and patterns in their prey, and they learn quickly. If you undertake potentially dangerous activities on the water's edge or in the water in the same place every day, you greatly increase the chances of attracting the attention of a crocodilian who may be waiting for you the next time. Avoid areas of crocodilian activity - look out for slide marks, drag marks, flattened vegetation, and other obvious signs that a crocodilian may regularly use a particular area, because there's a good chance that the individual responsible is never far away. Take care when launching or retrieving boats - although most crocodilians will avoid active boat ramps, some individuals may lurk or investigate activities associated with launching and retrieving boats, especially if the boat has been used for fishing. Avoid standing in the water when moving a boat on or off a trailer, and keep a careful watch for signs of crocodilians. Do not lean over the water from boats, overhanging banks or trees - leaning over the side of a boat that's close to the water is dangerous when crocodilians are around, they can strike rapidly at such low targets. Some species are known to launch up to their entire body length out of the water in an attempt to catch prey. When fishing, use landing nets to retrieve and release fish - crocodilians in some areas learn quickly to hang around under fishing vessels to steal fish caught on lines, so to avoid the possibility of being bitten use a landing net to retrieve the fish from the water. In catch and release situations, fishermen are often encouraged to allow fish to recover in the water by cradling them in their hands, but this should never be done in areas where crocodilians are found. Landing nets are just as effective for allowing fish to recover prior to release. Be responsible about cleaning fish and discarding scraps - never clean fish in areas where people are active, such as boat ramps, camp sites or the water's edge. Fish scraps attract crocodilians, and doing this where people are found is irresponsible and dangerous. Do not camp too close to the water's edge - generally it's advised to camp at least 50 m away from the water's edge, preferably up a steep bank (2 m high) where the likelihood of a crocodile wandering at night is reduced. Do not make assumptions based on common names - terms such as "saltwater" and "freshwater" are common when applied to different crocodilian species, and indeed the names "crocodile", "alligator" and "caiman" are often used interchangeably in different countries, so it can be dangerous to read too much into a common name. Most "saltwater" crocodiles for example are quite happy to live in freshwater areas. Crocodilians are most active by night, but can also hunt by day - although all crocodilian species are primarily nocturnal (ie. active at night) that does not mean that they will be asleep during the day. In fact all species can be active by day or night, sleeping only briefly and waking easily with minor disturbance. However, greater vigilance is necessary at night particularly during the warmer months of the year when activity levels are highest. Crocodilians prefer smaller prey - children are at much greater risk than adults, so keep them away from the water. Larger crocodilians will target dogs - walking in crocodilian habitat with a dog is risky because crocodilians will often target dogs, and this has been the cause of numerous near misses on humans. Some attacks on humans where dogs were present may also have been caused by the dog attracting the crocodilian's attention first. Never feed wild crocodilians - if you feed a crocodilian in the wild, it will quickly associate the presence of humans with food handouts. Far from being "friendly" or "tame", this increases the risk of someone being attacked whether deliberately or not. Avoid sleeping in a boat used for fishing - the smell of fish has been known to cause crocodilians to climb into the boat in search of food, and there have been a several recorded attacks resulting from this. Do not leave food scraps around when camping - food will attract predators and scavengers, including crocodilians. Do not try to tease, capture or interfere with crocodilians - in many areas it is illegal to interact with a wild crocodilian, typically because doing so carries a very high risk of being bitten or receiving a serious injury. Do not approach wild crocodilians too closely - the closer you are to a wild crocodilian, the greater the risk of being attacked. In some areas it is illegal to approach within a certain distance due to the higher risk involved. Be wary during the breeding and nesting season - adult crocodilians of both sexes become more active and aggressive during the breeding season, so there is more reason than usual to stay away from them. Never approach a wild crocodilian nest - adult females can aggressively defend their nest if you get too close (within 10 m) and there is a much greater risk of being attacked. Defensive females will often pursue potential threats more aggressively than normal. Never interfere with baby crocodilians - juvenile crocodilians readily produce distress calls if they are disturbed, and nearby adult crocodilians will typically respond very aggressively to any potential threat. Crocodilians cannot open their mouth underwater - some people believe they are safe as long as the crocodile or alligator remains underwater, but this is absolutely not true. Crocodilians have a special valve at the back of their throat (a palatal valve) which stops water from entering the throat. This means that any crocodilian species can open its mouth and bite even when submerged, and the majority of crocodilian attacks occur this way. Saltwater crocodiles are not found in freshwater - already mentioned earlier, but it's worth emphasising this because it's the cause of far too many crocodile attacks in Australia. Too many people believe that it's safe to swim in freshwater areas because saltwater crocodiles will never be found there. This is very wrong. All crocodiles including "salties" are actually freshwater animals, they are very much at home in freshwater. Salties only exist in more saline areas like tidal rivers because that's where the best food is found, and they have a tolerance for salinity. Crocodilians stash their prey under logs - it is often said that crocodilians take fresh kills and store them for several days under logs, because they need the meat to break down before it can be torn off and eaten. There is no evidence that crocodilians ever do this. They are more than powerful enough to tear off chunks of their prey by flicking the head, or rolling the body, and most food is at least partially consumed shortly after capture. Larger kills may be held onto for several hours before being eaten, and once sated crocodilians may leave the remains to rot even though they might guard them for several hours or even days. Remains of carcasses may themselves wash downriver and become lodged under branches.